Three George Mason University students who were arrested after police found "fire bomb" materials in a dorm have been barred from campus, the university said Wednesday. Last week, police were called to the Jefferson Hall dorm after someone saw flames shooting out of a window. Inside, authorities found drug paraphernalia and items consistent with the production of a dangerous device. Three students were arrested; two are facing drug- and alcohol-related charges, and one is charged with possession of bomb-making materials. "The students who were arrested are barred from campus property," George Mason University officials said Wednesday. "They are interim evicted from student housing and on interim suspension from the university, pending the outcome of the legal process." Northern Virginia bureau reporter David Culver talks with GMU students about explosives found in a dorm room. The officials said they were not releasing the names of the students involved, citing a privacy act and "the ongoing nature of the investigation." 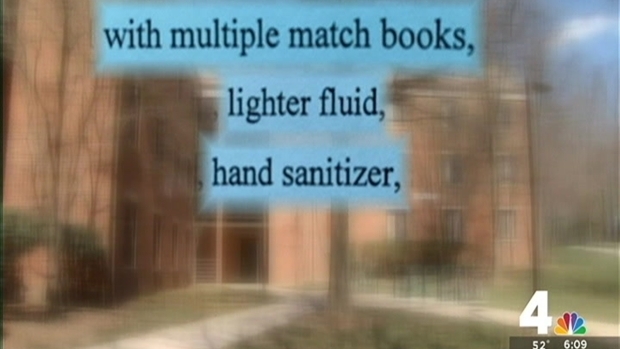 According to a search warrant affidavit filed in Fairfax County court by university police, investigators found a toolbox filled with multiple matchbooks, lighter fluid, hand sanitizer and candles. They also found a PVC pipe in the room. The investigators said in the affidavit that those items could be combined to "manufacture fire bombs" or make "explosive materials." University officials said Wednesday that the materials were found "in an inert state." The items did not pose an immediate threat to the residents of the building or campus, they said. "The fact that it was there and that no one else on the floor was able to catch onto that it was there, I mean that's concerning," Sydney Cano, a freshman at GMU, said Monday. Branden Adoseh, also a freshman, said he watched police collect evidence, bringing out a big container from the dorm room across the hall from his room. "I had no idea any of that stuff was in there," Adoseh said. "I mean, I know the people there, and I wouldn't say that any of them were doing too crazy. But, I had no idea what they had those for." While it was concerning to some students, others said they were not surprised. "No, (I'm not surprised). Not this day and age," said freshman Patrick Hare. "People do a lot of crazy things, sometimes in the region of being unsafe." Police have not released any details about any possible motives.